Some say the true test of a boot here in North America is a sheep hunt in AK or Northern BC. 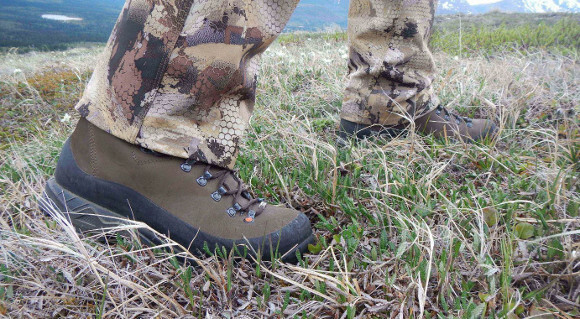 The guys at RemotePursuits.com have been putting the Crispi Hunter GTX to the test throughout the spring bear season in Alaska, and we are looking forward to how the sheep/moose/goat season goes this fall. This review is a compilation of their initial impressions after a few weeks of use. Here at Remote Pursuits we had heard a lot about Crispi’s new agreement in the US, and it convinced me to take a hard look at the Crispi GTX Hunter boot. After a bunch of research on them, I found they seemed to have all the same qualities and features I liked about the Kenetrek boots, but in a taller and internet”claimed” more durable package. All the reviews I found were very good, so I decided to go ahead and try them. I wore them a few times around town before going on my bear hunt and found them to be very comfortable. There was very little break in to them. Initially the folds of the tongue pressed against my shins and were uncomfortable, but after a few times wearing them the tongue wore in and became comfortable. I then got a chance to wear them out on a 5 day bear hunt. After 5 days in the boots I was very pleased with them. First the insulation of the boot was great. We had temperatures in the high 30’s at night and upper 50’s and low 60’s during the day, with cold winds coming off the snow peaks. My feet never got cold in the boots. Even when sitting on top of the mountain not hiking my feet stayed warm and comfortable. While hiking the boots had very good support and the Ankle Bone Support Structure (A.B.S.S.) system worked very well. My ankles felt secure and don’t roll or twist at all. Also, the protective rubber band around the base of the boot has held up very well at this stage in the test. Check out the rest of the initial review from RemotePursuits.com and be sure to watch for the full enchilada once sheep and moose season has come and gone later this fall.